EFF leader Julius Malema is to return to Nkandla to build a house for “Zuma’s Cousin”, he told farm workers gathered in Worcester on Sunday. Speaking to about 1 000 farm workers and farm worker representatives who travelled from De Doorns, Paarl, Robertson and Ashton – all areas seriously affected by the farm worker strikes in late 2012 – Malema said he was going to teach Zuma a lesson in how to take care of his family members, alleging that one of the president’s cousins lived in poverty in Nkandla. Ignoring the fact that a disproportionately large number of President Jacob Zuma’s family members are involved at the top levels of business in South Africa, Malema said if Zuma did not know how to take care of his family, how was he going to take care of the people of South Africa? Disaffected farm workers poured their hearts out to Malema when he addressed them in Worcester during his three-day tour of the Western Cape, with many of them vowing to join the EFF. The main issues raised were the abuse workers said they received on the farms, land, housing, unemployment and education. Farm workers said they were still living under apartheid conditions and had no platform to raise their concerns. Even though the national minimum wages for the agricultural sector had been raised from R70 to R105 per day following strike action in late 2012 and early 2013, they said they did not receive that amount in their paycheque. 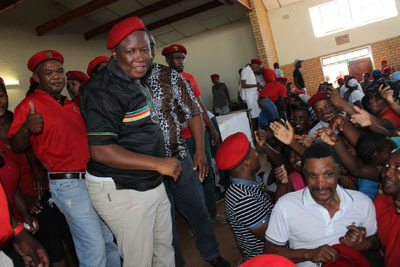 Bawusa representative Ndawule Majodina, from De Doorns, which has been the epicentre of unrest in the province’s agricultural sector, announced his intention to join the EFF. He said farm workers had been longing to meet Malema and were happy he made time to meet with them. “As Bawusa we will support the EFF, we want the government who is going to bring change. We are working for cents even after striking last year. Instead of getting the salary we were fighting for, we got arrested. There’s no service delivery in our areas and we believe EFF is going to bring change,” he said. Majodine was then given a red beret on the spot. Teboho Matzokotsi 48, from Robertson said, he had been working on the farms for 23 years and earned “peanuts”. He said not once did government or a minister visit the area. Matzokotsi said among challenges workers faced in Robertson was “if you don’t speak Afrikaans you don’t get hired”. “We are all the victims of apartheid,” said Malema, adding that workers needed to unit to defeat the “white people”.